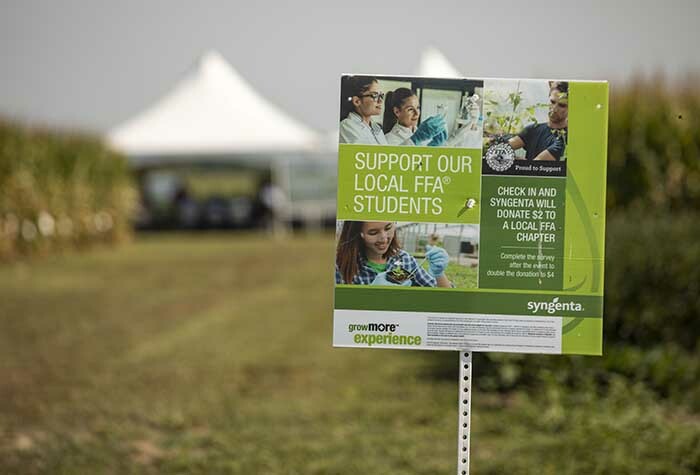 Syngenta donates to local chapters of the National FFA Organization at each 2018 Grow More Experience event. This summer, each of the Grow More™ Experience sites partnered with a local chapter of the National FFA Organization (FFA®). For each visitor who registered at an event with a valid email address, Syngenta donated $2 to that site’s local FFA chapter. For visitors who completed a follow-up survey about their experience onsite, Syngenta doubled the donation. In total, Syngenta contributed $13,950.
.@SyngentaUS donates to local chapters of the @NationalFFA Organization at each 2018 #GrowMore Experience event. Syngenta will distribute the funds raised to eligible FFA chapters. Each chapter will use the proceeds to support ongoing agricultural education and skills training for local students. To learn more about this Grow More Experience partnership, contact your Syngenta representative. As part of the Resistance Fighter program, the company has recently developed a new agronomic resource—the “How It’s Done” video series.